Anyone with an understanding of the realities of heredity and ethnicity knows, as the saying goes, that “demography is destiny.” To understand this is easy, to actually act upon these demographic trends is, however, quite difficult. It is very hard to get your citizens to make more babies and even hard to get the “right” ones to do so. Hungarian Prime Minister Viktor Orbán: Practicing what he preaches. An ethic based on a belief that men are different from what they are is manifestly stupid. It is stupid to apply such an ethic as it is to apply laws and morals designed for a nomadic tribe, or for a tribe in the state of barbarism, to a people crowded into the slums of a modern metropolis. Thus in the tribe it is well to beget children, for the more strong male children you have in the tribe, the less likely you are to be bashed on the head by males of neighbouring tribes, and the more female children, the more rapidly the tribe will increase. Conversely it is a crime rather worse than murder to beget children in a slum, to beget children for whom no fitting provision is made, either as touching their physical or economic wellbeing. In modern times, one cannot however rely on such coercive traditional cultural norms to maintain fertility rates. Most people rebel against them (perhaps, in a few centuries, we will find that small groups that manage to maintain traditional fertility, such as the Mormons and Orthodox Jews, will inherit the Earth). Moderns find it difficult to raise fertility. The French were greatly concerned about their demographic decline in the nineteenth century, by which they went from being Europe’s preeminent power to merely one great power among several, vulnerable for the first time to German hegemony. France’s various pro-natalist policies were quite ineffective however, although perhaps these eventually bore fruit with the country’s strangely long-lasting postwar baby boom (France maintained replacement-level fertility long after it had collapsed in most of the rest of Europe). Only a few modern countries, it seems to me, have been successful in raising or maintaining fertility: these include Fascist Italy, the Third Reich, and Israel. In each case, pro-natalist policies are not taken in isolation, but reflect an encouraging total context in which children are valued by the entire society and culture, as enabling the survival and power of a particular people. 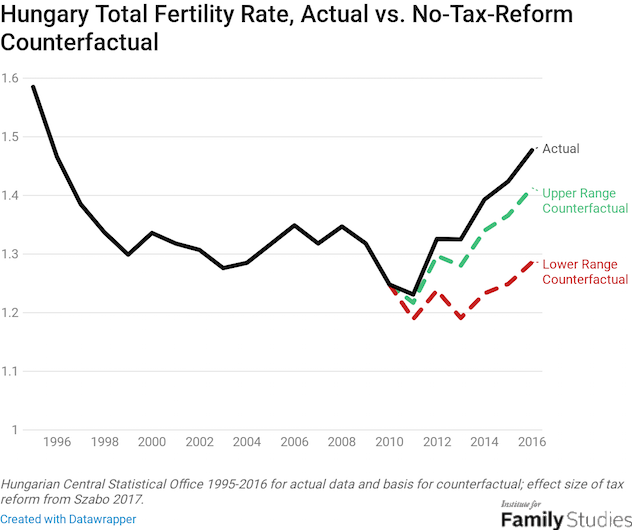 Since the eclipse of Darwinism after 1945 and of communism after 1989, few European countries have really attempted to raise their fertility rates. Today, serious efforts are being made in more and more countries swept by “national-populist” revolutions: namely Hungary, Poland, and most recently Italy. Hungary is the country which has undergone the most profound and lasting of these revolutions since Prime Minister Viktor Orbán came to power in 2010. I would like to go over Hungary’s various natalist policies and consider their degree of success. Personally, I prefer the term “communitarian democracy.” But in any event, the Hungarians have constitutionally founded their state on the basic Aristotelian principle of community: that one can only consider individual well-being starting from the well-being of the whole, of the community of which he is necessarily a part, and which will outlive him. Previous research by academics suggests that this increased tax exemption for kids probably did boost birth rates. They estimate that the policy change caused between 6,000 and 18,000 more births from 2011 to 2013.
. . . [N]one of the policies I reviewed for the U.S. quite approach the magnitude suggested here: the very largest, most bold proposal for the U.S. that I’ve ever seen would be at the lower-end of the range for a Hungary-style proposal. 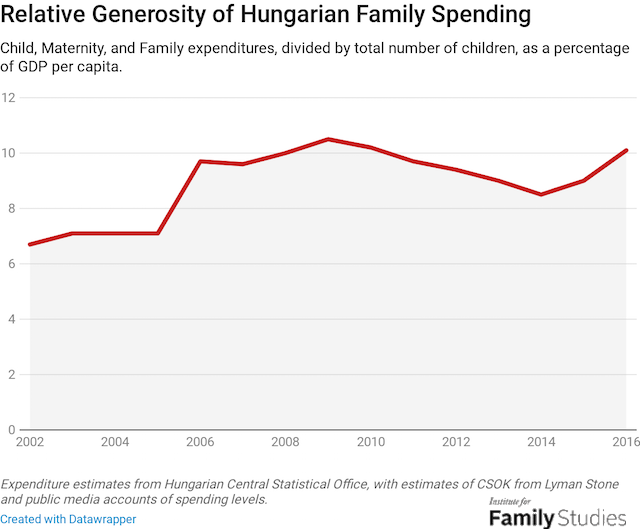 No American policymaker has ever proposed something remotely as generous as what Viktor Orban’s Fidesz party has recently done for Hungary’s families and children. I said a similar thing in a previous piece about Poland’s right-wing populist government, which virtually ended child poverty through their generous family-support policies. Europe’s populists have babies on their mind. The sheer scale of these programs is impressive indeed. 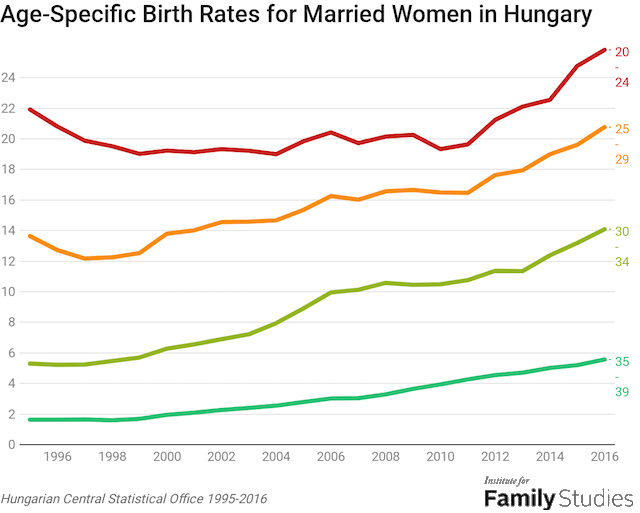 Besides their electoral benefits (voters do love “gibs”), this is clearly an indicator that Orbán’s government is seriously and sincerely motivated to reverse Europe’s demographic decline. In recent years, finding the proper response to Europe’s demographic decline has become one of the biggest sources of disagreement between European and Hungarian politics. 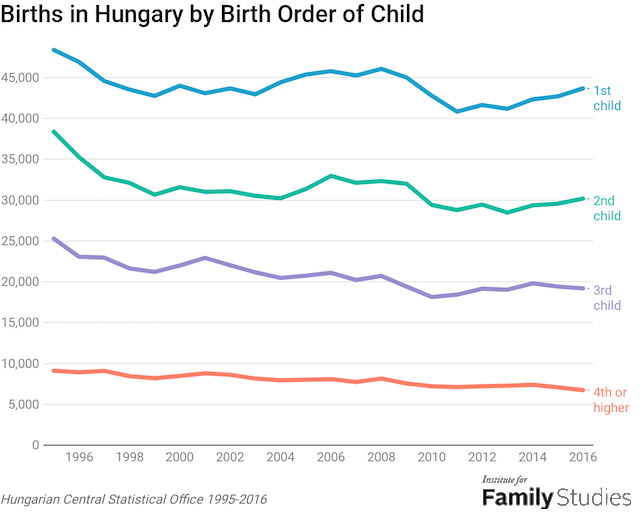 While Brussels bureaucrats and the European liberal, pro-migration mainstream see immigration as the necessary and unavoidable solution, the Hungarian government stands committed to the idea of increasing birth rate through more effective family support measures…. On top of this, over the last seven years, 83,000 families have received home purchase subsidies, households have saved 1.9 billion HUF (6m EUR) on account of family tax preferences, and the number of places in crèches has increased by 50 percent. 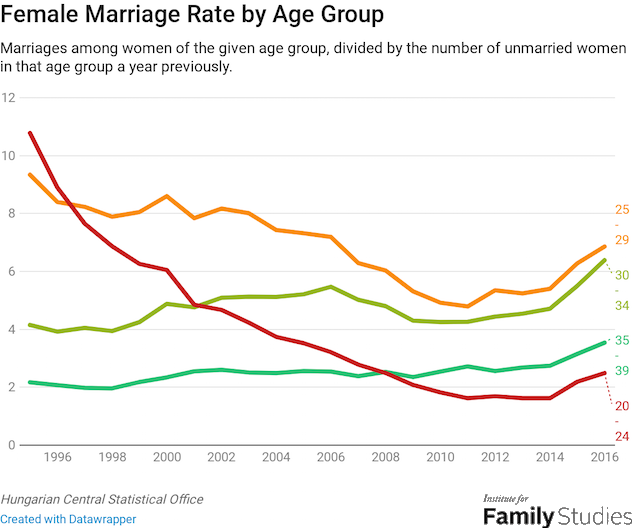 [I]n Hungary, the rise in the age of first marriage, which has been so inexorable in other countries, has actually stalled out and perhaps started to fall. 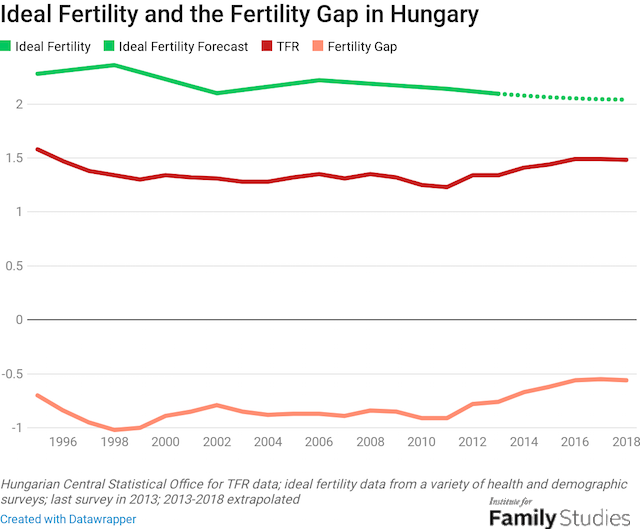 The country is not just experiencing a fertility spike; Hungary is winding back the clock on much of the fertility and family-structure transition that demographers have long considered inevitable. The questions relate to the introduction of full-time motherhood for women raising a minimum of four children, the two-thirds protection of grants provided for families raising children, and the provision of support for family members looking after sick children at home. . . . I note that the particular major [sic] of having family support be “tied to employment” helps to ensure that the reproduction of anti-social elements is not subsidized. 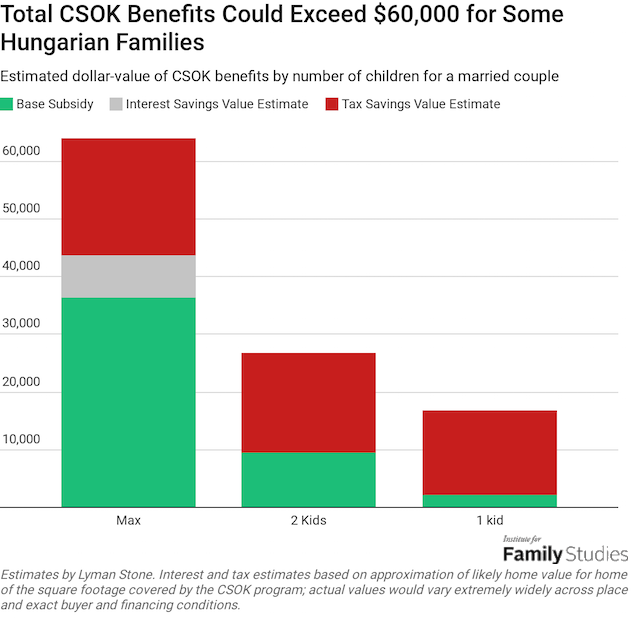 I would wager this means that these programs disproportionately benefit indigenous Hungarians, to the detriment of Gypsies. The issue here is not distaste for, or persecution of, this or that minority, but whether Europeans will even retain their homelands in the twenty-first century. As Orbán recently noted in a remarkable speech – which will hopefully not be studied by future historians as one of those “prescient but ignored” historical document – globalist elites are “slowly but surely turning indigenous Europeans into a minority” in their own countries. Experimentation of various programs and methods across Europe in our various nation-states. A general European cultural revolution whereby we all lastingly come to recognize the importance of the family and of biological reality. These things take time. 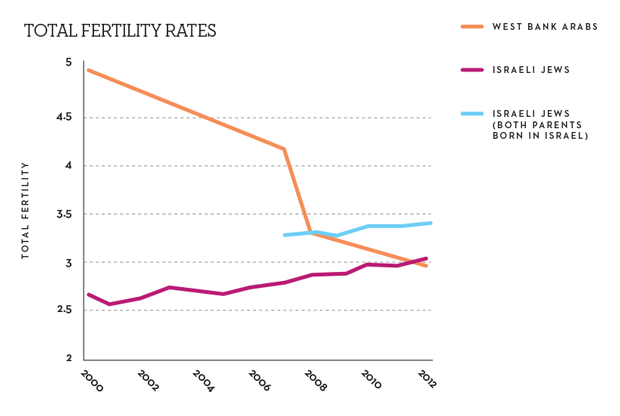 By way of comparison, I observe that it took many decades for Israel’s pro-natalist policies to bear fruit, recently overtaking Arab fertility, a remarkable achievement. Europeans then have their work cut out for them, the work of a century at least. In the meantime, God bless the Hungarians! Ezra Pound, “The Serious Artist,” The Egoist, 1913. Homer (trans. G. S. Kirk), Odyssey (Oxford: Oxford University Press, 1980), 6.121-200.